"Assemble the chicken, vegetables and sauce for this dish in the morning or night before so that you have dinner ready to pop in the oven when you get home from work." Preheat the oven to 350 degrees F (180 degrees C). Heat the oil in a nonstick skillet set over medium-high heat. Season the chicken with the salt and pepper; add to the skillet in batches and brown all over. Bake, covered, for 30 minutes; uncover and bake for 30 minutes or until chicken is tender and vegetables are cooked through. Meanwhile, prepare the noodles according to package directions. 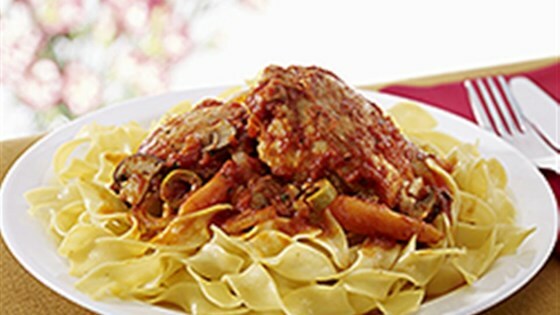 Arrange the noodles in a large serving bowl and spoon over the chicken, vegetables and sauce. Garnish with parsley and Parmesan (if using). Replace the Extra Broad Noodles with NO YOLKS® Broad or Dumpling Noodles. Transfer the chicken and sauce mixture to a crockpot and cook on low heat for 6 hours. Add the vegetables and continue to cook on low for 2 hours or until tender.